In the past five years, the United States, the European Union, and Japan have each moved aggressively to develop their own plans for achieving exascale computing in the next decade. Such concerted planning by the traditional leaders of HPC speaks eloquently about both the substantial rewards that await the success of such efforts, and about the unprecedented technical obstacles that apparently block the path upward to get there. But while these exascale initiatives have understandably focused on the big challenges of exascale for hardware and software architecture—exponential increase in parallelism, energy efficiency as a first class design constraint, heterogeneity in several different dimensions—the emergence, during the same time frame, of the phenomena of Big Data in a wide variety of scientific fields represents, not so much a new obstacle, but rather a kind of tectonic eruption that is transforming the entire research landscape on which all plans for exascale computing must play out. The workshop series on Big Data and Extreme-scale Computing (BDEC) is premised on the idea that we must begin to systematically map out and account for the ways in which the major issues associated with Big Data intersect with, impinge upon, and potentially change the national (and international) plans that are now being laid for achieving exascale computing. The goal is to help the international community develop a plan for building a partnership to provide the next generation of HPC software to support big data and extreme computing for scientific discovery. The third meeting in this series of 2-day workshops will be held in Barcelona, Spain on January 29th and 30th, Thursday and Friday, with a reception on Wednesday, January 28th. 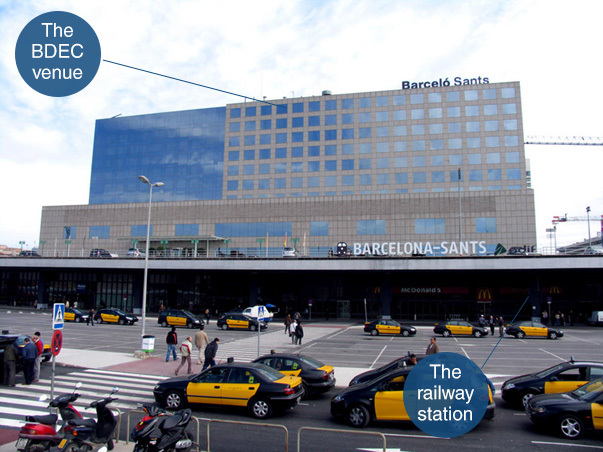 The workshop itself will be held at the Barceló Sants Hotel. Along with application leaders confronting diverse big data challenges, attendees will include members from industry, academia, and government, with expertise in algorithms, computer system architecture, operating systems, workflow middleware, compilers, libraries, languages and applications. Attendance at the workshop is by invitation only. An international workshop on the post-Peta path forward to extreme scale scientific computing, taking into account the full range of complicated issues that the community confronts in the era of Big Data. This is the third in a series of three workshops. The second meeting was held in Japan, see: http://www.exascale.org/bdec/documents/fukuoka-japan for the workshop report, which includes the full agenda with links to all the presentations and breakout notes. Create an international collaborative process focused on the co-design of software infrastructure for extreme scale science, addressing the challenges of both extreme scale computing and big data, and supporting a broad spectrum of major research domains. To stimulate brainstorming even before the workshop, we are soliciting 2-page position papers outlining a key need or proposed architecture or solution from you. Please send your white paper to bdec [at] exascale.org. We will select 15-20 white papers for 6-minute talks. White papers are due January 12th, 2015. The workshop will commence with a reception/registration at 8:30am on Wednesday, January 28 at the hotel. There will also be registration available throughout the workshop, which will continue for the next two days and will wrap up around 5pm Friday, January 30. You can complete the accomodation form here: https://www.eventspro.net/barcelo/getdemo.ei?id=1250134&s=_7RO9ZTF8O. BDEC attendees will be flying into Aeroport de Barcelona – El Prat. Transportation from the airport to the Barceló Sants Hotel is available by taxi, bus, train or rental car. Travel time from the airport to the hotel should take around 20-30 minutes, depending on traffic.